Here is a case where the saying “what you don’t know won’t hurt you” is wrong. Flame retardant chemicals are added to furniture and electronics to meet flammability standards in cities and states across the nation. 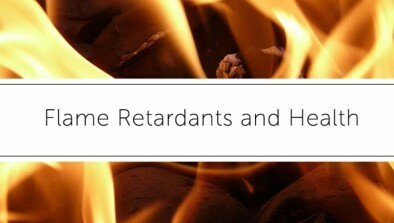 However, the flame retardant chemicals are often unnecessary for fire safety and also toxic to human health. Scientists have shown that these chemicals travel out of products and enter our homes and bodies at levels that raise health concerns. There is evidence that flame retardant chemicals can cause cancer, disrupt normal hormone functioning related to reproduction and development, and affect brain development. Chemical flame retardants have surrounded us for far too long and contaminated our bodies. I, like many people have lived most of my life without the knowledge that I was exposed to these chemicals every day, and without any idea of the implications for my health. As someone who graduated from the University of Florida with a major in Public Health, I find it interesting that in my four years of college the topic of chemical flame retardants was never brought up. This fall, however, my eyes have been opened through an internship with Clean Water Action. Working with Clean Water Action, I’ve learned how to read furniture labels in search of chemical flame retardants, have witnessed major retail companies like Macy’s phase out the selling of chemical flame retardant laden furniture, and have heard heartbreaking stories of families being torn apart by illnesses endured by a loved one because of the impact of the chemicals. Clean Water Action, in partnership with The Alliance for a Healthy Tomorrow has been working with a wide range of people, from legislators to firefighters to students to business leaders on phasing out chemical flame retardants in favor of non-toxic fire safety standards. This fall I began a certificate program in legal studies at the Harvard Extension School. It’s been refreshing to see the University make efforts to identify chemical flame retardants and work to protect student health through its sustainability commitment. Some of the projects I’ve admired are the distribution of Chemical Flame Retardant-free Toolkit and Buyer’s Guide to all of Harvard’s purchasers, project managers, facilities leaders, and outside vendors. Even more impressive is Harvard’s decision to be at the forefront of the issue by becoming the first university to take the Center for Environmental Health’s pledge to go flame retardant free. Now that’s appropriate leadership for a world-class institution. Victoria is pursuing a certificate in legal studies at the Harvard Extension School. @GreenHarvard about 17 hours 14 min — @HarvardMuseums @HarCommonSpaces Go, @HarvardMuseums! Striving for a plastic-free future! !